Modification of the Epson V850 pro and V800 film-holder for the 120/220 medium format film and the 4x5" sheet film. The 120 and 4x5" holders that are delivered with the Epson V850 pro didn't live up to my expectations and it was necessary for me to do this mod since the original design make them difficult for me to use and giving me trouble getting the film aligned and to stay flat aver the whole length and width. NOTE: The 35mm filmstrip holder does NOT share this problem and works just the way I like them to do. The modification of the 120 and 5x4" film-holders are quite straight forward and does not require any special tools, all you need is a sharp X-ACTO knife and a steel ruler to cut along. 1. Open the film-holder and gently remove the hinged frame. to pinch it under the beveled tabs. 3. 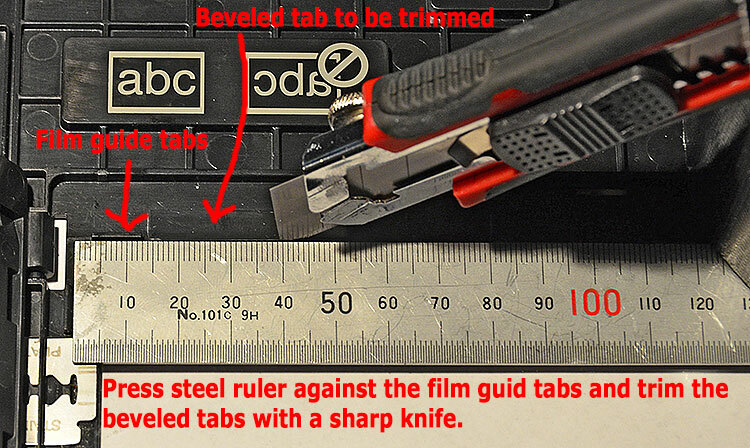 Place the steel ruler and press it against the small film guide tabs (shown in the image above) and hold it tight. 4. Now use the sharp knife (New blade) and cut multiple times and without using excessive force along the ruler until the beveled part of the tabs are cut away. I found out that the quality of the plastic was quite good so I had no concerned that the film-holder would break into pieces. Nice and clean cut, it took me about 30min to cut all six tabs. In this image you can also see the film that I pinched under the tabs to protect the AN "glass". Q - Will the AN "glass" fall out when you cut the tabs? A - No but it might come loose if you abuse/bend the holder to much and then you have to re-fit it with some plastic glue! 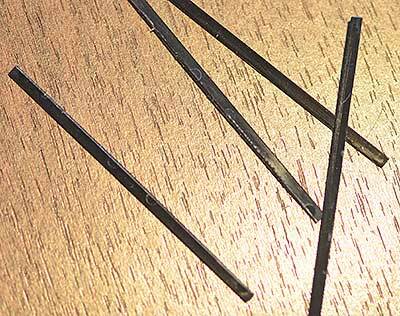 You will end up with six plastic strips like this when you are done with the first and most essential film-holder modification. One of the cut-offs will be used in the next mod so pleas don't throw them away yet! The cut-offs are quite skinny still non of them fell apart due to the resilient plastic quality. How do I support this website? This modification further improve the holder to make it less cumbersome to load curled film strips in the 120 film-holder. This mod is also a quick and dirty fix. In this case I just used the same knife as used in the "tab mod". 1. 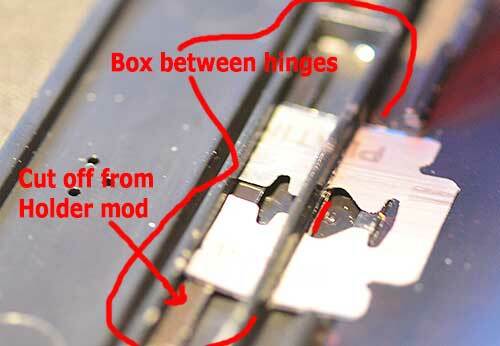 Just cut a slot in the small box created in the film-holder mold between the two snap in hinges. 2. Push in a thin tab of some springy material trough the slot you just cut. 3. Use one of the cut-offs from the "tab mod" and pinch it under the spring tab (inside the small box you made the cut-out in) this will help to increase the spring force. Gently push the film under the spring tab when you load the film in the modified film-holder, this will simplify the loading allot and in particular if the film are newly developed and excessively curled. If the film is bowed length wise, load it emulsion side down (matte side against you) then flip it in scanner application or image editor afterwards. Tips: A good way to keep and make the film strips flatter is to store them in pockets inside a binder for a while. If the binder isn't full then just add up with some sheets of paper to get some pressing force on the film strips, this will help to flatten them. 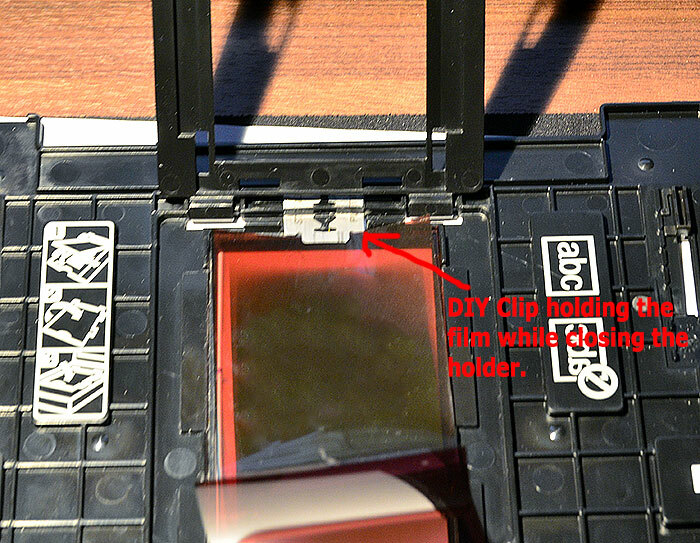 Close up of the Epson V850 Pro 120 film holder spring clip mod. This modification is simple and fast to perform, it took me about 15 minutes. The thin razor blade can be cut with a regular pair of scissors. I used blades intended for shaving not the industrial type since they are to thick and stiff. Another view of the mod. 2. The cut to host the spring (razor blade). The spring clip mod can be further improved by making a custom spring from thin spring steel sheet metal cut in to a thick T-shape that clamps the film along its full width. Software tweaks and settings for best result. However expect this to be posted soon. Multi exposure (Vuescan will be used). Useful software for scan improvements. Review of the Betterscanning.com film-holder published NOW! Comments on the Epson Perfection V850 Pro review here!